Migrate from Raiser’s Edge to Salesforce. Nationwide more and more nonprofit organizations are moving from Raiser’s Edge to Salesforce.com (read a case study here). Currently the data migration process often takes longer than expected, is cost prohibitive, and is susceptible to human error. Why are they migrating? Raisers Edge is hosted on your IT infrastructure (or forces you to use Citrix for a limited remote login) and therefore requires you to maintain a large server system and provide the services and support associated with that hosting. Salesforce is hosted in the cloud, on Salesforce’s distributed and secure servers. With Salesforce, you will see a difference in time and money for maintaining local servers and a bit less stress for your IT staff. Maybe you want to adopt a Bring Your Own Device (BYOD) policy for your employees – an increasing trend with many companies. If your team members want to work on a Mac based operating system, then you’ll run into some challenges with Raiser’s Edge. Mac users will have to log into a virtual Windows based machine in order to access RE. I know from personal experience that when the virtual machine connection, typically Parallels or something similar, runs slow or goes down, users just won’t enter information. And, they may be deterred from even trying to log in if they consistently run into a slow connection. This could mean that your database is not actually working for you and you are missing critical pieces of relevant and valuable information. Salesforce is cloud based, so your team can access it wherever they have internet service from whatever type of device they prefer to use. To add onto #2, Salesforce1, Salesforce’s mobile tool, is a highly sophisticated mobile application. Your users will find it intuitive and easy to use and your admins will find it easy to customize. You have all of the same functionality that is accessible online, in a handy mobile package. Unfortunately, Raiser’s Edge NXT just does not compare. Users are very limited in what they can edit or add in the mobile or web interface and it still requires Raiser’s Edge 7. To be blunt, it’s kind of like lipstick on a pig. You’re a nonprofit, right? So the goal is for as much money as possible to go directly toward your programs and fulfilling your mission. Salesforce.org donates up to 10 licenses for nonprofits and offers additional licenses at a deep discount. This means big savings for your organization! Third party applications that integrate with Salesforce also have great nonprofit pricing. Rasier’s Edge pricing depends on the client – number of licenses (concurrent users), amount of data stored, amount of revenue of the organization, and other factors. Maintenance is also based on a sliding scale encompassing all of those factors, and is charged annually. These fees can add up over time. Well, maybe Salesforce isn’t exactly like yoga, but it is a flexible system that allows your users to choose their path. It also allows you to easily customize some parts of the system without knowing code or entering the deep-dark “back-end” of the system. The user pathways in Raiser’s Edge are more prescriptive and less flexible. Changes to the system will likely require outsourced or highly technical staff support. 6. Apps, apps and more apps! At Cloud for Good we love apps that add functionality and connect our systems together. Salesforce is unique in that they allow developers to access the API and develop apps (or applications) and integrations to work with Salesforce. You can find apps for budgeting, volunteer management, mail merges, event management, and much, much more. On the AppExchange, you can find a fair number of free apps and most companies provide discounts for nonprofit organizations (reference #4). There is nothing comparable to the Salesforce AppExchange. You’ll likely need to find a developer in order to do any integrations with RE. Constituent relationship management is not just for your fundraising team. With a tool like Salesforce you can customize a user’s experience based on their role within your organization. Certain objects and fields can be visible to the program team, while others can be visible to the fundraising team. And, at the same time, the teams can collaborate on building relationships with constituents. This collaborative approach to relationships is becoming more and more relevant for organizations as donors and grantors desire to be involved and informed about programs, outcomes, and decisions. In most instances where Raiser’s Edge is used, it has been the system of record for many, many years. Hence the common term “legacy system”. Over time, staff turns over, data requirements change, and policies and best practices may change as well. All of this impacts how your data is entered, stored, and used. A major system overhaul is a great opportunity to give your data a makeover. We find that a lot of organizations hold on to data as a kind of security blanket and storing that data costs money. A data makeover will help you to identify what information is valuable and worth keeping and what data is just taking up space (and costing money, see again point #4). The Salesforce.com 1:1:1 model shows the company’s dedication to integrated philanthropy. They promote a culture of helping employees give back by giving employees six days of Volunteer Time Off (VTO) per year to volunteer for a cause they care about. 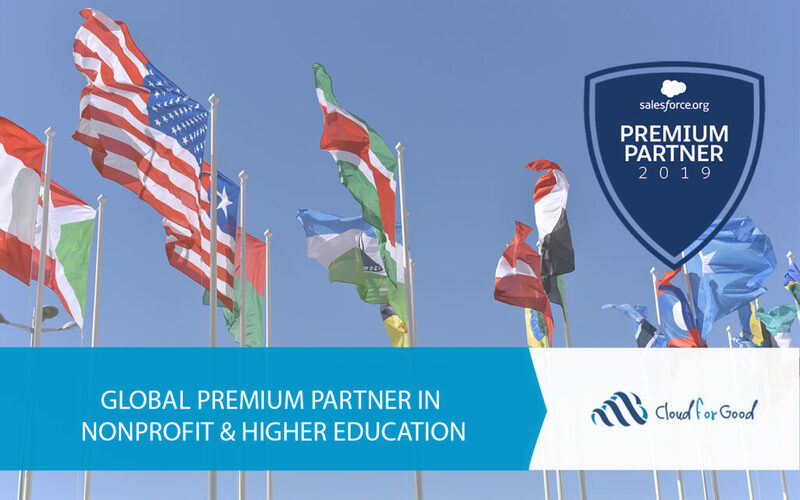 Through the Power of Us Program, Salesforce.org donates products to eligible nonprofit organizations and higher education institutions (you benefit from this too!). Since its inception in 2000, the Salesforce Foundation has given over $85 million in grants. When you work in the nonprofit sector, there is something refreshing about working with companies that are also invested in community and giving back. Cloud for Good has adopted the 1:1:1 model and we encourage you to read about our corporate social responsibility program. Raiser’s Edge is a big company. Sometimes, calling big companies can feel like a labyrinth before you actually get the support you need. Organizations using Salesforce have a wide variety of support options. The Salesforce Help & Training is REALLY helpful. Even with a basic support plan, you can be confident that a Salesforce support staff member will get back to you. And then there is the Power of Us Hub and the Success Community. With these two communities, you have access to hundreds of thousands of Salesforce gurus who will help you solve your problem or direct you to the documentation that can help. Oh, and did I mention that these support communities are free (again, reference #4)?! In addition to these great support options, a simple Google search or YouTube search will turn up videos and presentations that can further your learning and turn YOU into a Salesforce guru too! So what can we do to address the most painful part of an implementation? Cloud for Good partnered with the good people at Apsona and together we developed Over the Edge, an easy to use step-by-step tool to extract, transform, and load Blackbaud’s Raiser’s Edge data into the Nonprofit Success Pack, Causeview, and NGOConnect (formally roundCause). Instead of paying for hundreds of hours for data migration you can now reduce risks and costs with Over the Edge. We can help you navigate through all of the options when looking at implementing a fundraising solution on the Salesforce platform. After our evaluation is complete we will implement Salesforce to meet your needs, migrate your data, and train your users. Watch our Friend’s Don’t Let Friends Use Raiser’s Edge webinar and contact us today to go Over the Edge. Cloud for Good is ready to help you create transformational value on the Salesforce platform.